The holiday period saw UK Internet TV users being given more viewing options than ever before. 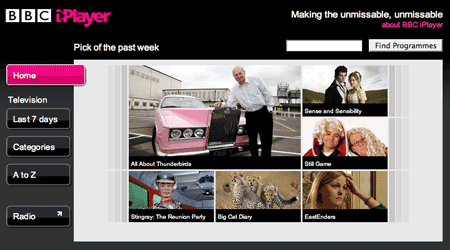 Zattoo opened its Beta to the British public and the BBC with its controversial iPlayer – now updated to offer a Flash video-based Mac, Windows and Linux compatible streaming version – did the same. We first reviewed Zattoo, a P2P-based desktop application that offers live streaming of existing ‘over-the-air’ and cable channels, back in July — noting that in comparison to the likes of Joost and Babelgum, both of which attempt to recreate the “lean back” experience of television, Zattoo is more at home being used “in a multi-tasking environment, where users watch television in one window on their computer, while accomplishing other tasks in another such as chatting to friends over IM, surfing the web or writing email”. Then in closed Beta, the UK version of Zattoo had a channel lineup which notably included all of the BBC’s digital channels: BBC One, Two, Three, Four, along with BBC Parliament, News 24, and the BBC’s two children’s channels. The reason for removing BBC 1 and 2 is the following: Zattoo is currently running an open beta in the UK and is only retransmitting programs that are delivered nationwide without any regionalization. As BBC 1 and 2 are channels with heavily regionalized content, we would have had to blacken out so many programs that it would have diminished our users’ viewing experience too much. We’re planning to increase our UK channel lineup by summer 2008 to include channels with regionalisation, including BBC 1 and BBC 2. While national restrictions imposed on Internet TV offerings is all too commonplace in order to enforce international territorial rights, it’s the first time I’ve heard of domestic regionalization getting in the way. 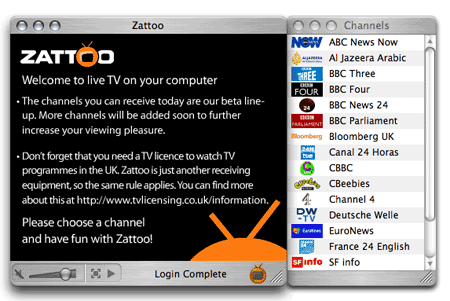 However, of some compensation to UK users, the splendid Channel 4 has now been added to Zattoo’s lineup. December — Christmas day to be precise — also saw the BBC’s iPlayer leave its limited Beta as part of a major marketing push. And rolled out with less fanfare than the iPlayer’s original launch, was a streaming version offered in partnership with Adobe (see our previous coverage), giving access to Mac, Linux, as well as Windows users.